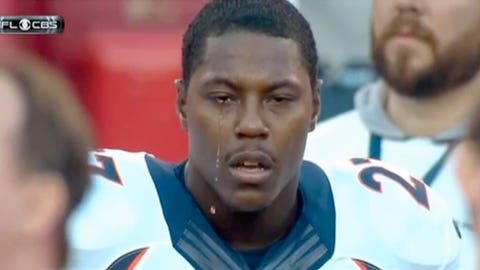 The video of Knowshon Moreno crying during the national anthem before Sunday’s Broncos-Chiefs game lit up the Internet. We’re guessing you’ve seen the GIF/video of it by now. And maybe it confused you a little bit. Was he crying? Did he just take eye drops? Is this real life? After the game Moreno had an awesome explanation for the tears. "The emotion always gets to me," he told Yahoo! Sports. "I am just thinking about everything in general through your whole life, just balled up into one. Yeah, it helps me. Sometimes I don’t even notice it, it just comes." Now a day later we have found the perfect video of that surreal moment: Moreno crying set to Whitney Houston’s song "I Will Always Love You."